Having to give up gluten need not mean having to give up taste or nutrition. There are special versions of products available, but recipes and cuisines that don’t need gluten substitutes make life much easier. The fresh and tasty Mediterranean diet has been shown be one of the healthiest on the planet. Greek-style is a particularly good way to eat, and with a few tweaks the recipes work perfectly for gluten-free requirements. For instance, moussaka can be made using cornflour for the béchamel sauce, and when summer comes the standard Greek salads and yogurt-based dips need no changes. 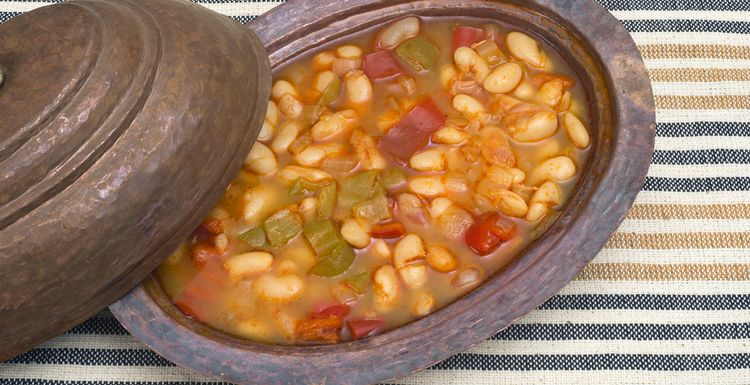 Here is a variation on the classic Greek dish Gigantes Plaki (baked giant beans). It tastes good fresh and even better reheated, so make double at the weekend and freeze or chill half for a low-effort weeknight meal. With plenty of protein and vitamins, this bake provides nutrition to match its taste. Butter beans work perfectly as authentic ‘gigantes’ can be hard to find. Feel free to substitute or add other vegetables, and don’t worry too much about precise quantities. Greek cooking is an art, not a science! Add the tomatoes, herbs and spices and cook for five minutes until slightly reduced. Tip half the beans into a rectangular baking dish and top with half the sauce. Add the rest of the beans and then the remaining sauce. It won’t stay separate but we’re not worried about that! Cover and bake at 180 degrees centigrade for an hour. Top with crumbled feta (if using) and enjoy with a side salad or just as it is. I am also waiting for courgettes! I don't need gluten free but I love my Greek food and this looks delicious. I might throw in some fish or meat for a change, not authentic but I'm sure no-one will mind. This will be on my to-make list when my garden courgettes have grown. I always have a glut. More courgette recipes will definitely be welcome this summer!